The Yellow-crested Cockatoo (Cacatua sulphurea) is Critically Endangered in the wild. Progress and outcomes: After the Yellow-crested Cockatoo was added to CITES Appendix I in 2005 WPT and a Swiss member funded part of the work of Kinnaird and O'Brien from the Wildlife Conservation Society (WCS), to study the Citron-crested Cockatoo (C. s. citrinocristata) on the island of Sumba. The Indonesian conservation ministry PHPA at the time held a dozen confiscated birds, and the opportunity was taken to fit them with radio collars to study their movements and behaviour on release. In 2015, WPT supported a survey conducted on Komodo Island, which concluded that the parvula population is stable in Komodo National Park. According to park records, the population in 2015 was 695 cockatoos, up from 2010 at 558. A survey of West Nusa Tenggara province, including Moyo and Sumbawa islands, in 2016 found a population of 145 individuals, while a follow-up count in 2017 showed that the populations were stable. From 2017-2018, WPT has teamed with local officials from the Nature Conservation Agency Indonesia (BKSDA), and community non-profits, to spread awareness to children and adults about the threats that face these birds. Training sessions on bird-watching and tour guiding were held so that communities may benefit from protecting the cockatoos. With your help we can better understand the lives of these cockatoos, and work towards effective solutions to further their conservation. Where found: The Yellow-crested Cockatoo (Cacatua sulphurea) is found on various islands in Indonesia – the nominate race sulphurea is found on Sulawesi, and introduced to Hong Kong and Singapore, parvula is spread out on 8 islands including Nusa Penida and Lesser Sunda Islands, abbotti is restricted to Maskambing Island and citrinocristata is found only on the island of Sumba. Feral populations in the low hundreds of C. suphurea have established in urban environments in Singapore and Hong Kong (Long 1981, Lever 1987). 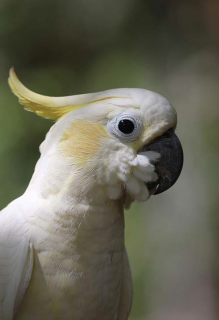 History: The Yellow-crested Cockatoo was formerly common throughout Nusa Tenggara, Sulawesi and other islands and the Masalembu Islands in Indonesia. Now it is confined to a few islands: in the past 40 years it has suffered massive population declines estimated at more than 80%. The nominate race and all related subspecies have been reduced to small remnant populations of only a few hundred birds scattered throughout Indonesia. Three subspecies, sulphurea, abbotti, and citrinocristata, are the most imperiled. The subspecies parvula is somewhat more robust. The total population of all subspecies is likely fewer than 1,000 birds. Ecology: Yellow-crested Cockatoos are found up to an altitude of 1200m (3936 ft). They are found in forest edge, woodland, farmland, coconut palms, semi-arid areas and forest. They eat seeds, fruit, berries, flowers and nuts, and may also take cultivated maize. Birds are usually encountered in pairs or small groups of up to ten birds, with larger flocks forming to feed in fruiting trees, where they are noisy and conspicuous.